As the Tribune’s Blair Kamin recently pointed out, it’s embarrassing that San Francisco will soon have more than eighty “parklets”—parking-lane space repurposed as picturesque seating areas—while our much-larger city only has a handful of them. Dubbed “People Spots” by the Chicago Department of Transportation, which runs the program, eight of these have been put in on business districts in Grand Boulevard, Kenwood, Lakeview and Andersonville. The beauty of parklets is that they take asphalt that’s usually reserved for warehousing private automobiles and transform it into attractive, planter-enclosed public space where neighbors and shoppers can congregate. The People Spot nicknamed “The Wave” at Addison and Southport in Lakeview is practically public art—its undulating, freeform seating units are both comfy and reminiscent of whale skeletons. A study by Metropolitan Planning Council found that, since People Spots encourage people to linger on Chicago’s retail strips, they’re a shot in the arm for local businesses. Eighty percent of merchants surveyed felt nearby parklets helped attract customers to their establishments. Seventy-three percent of parklet users said that, if they weren’t eating, chatting, texting or relaxing in the spaces, they’d probably be at home. Thirty-four percent of them said they made spontaneous food or beverage purchases as a result of the inviting hangout space. Despite this success, by midsummer of this year, the two Andersonville parklets still hadn’t been reinstalled after being mothballed for the winter. One of them, consisting of boxy, blue wooden seating units, has stood at Clark and Farragut, by an Akira clothing boutique and the Gus Giordano Dance School, during the warm months of every year since 2012. The other, a more rustic enclosure made of recycled lumber, first opened in 2013 at Clark and Olive, by Piatto Pronto Italian deli and the Coffee Studio café. 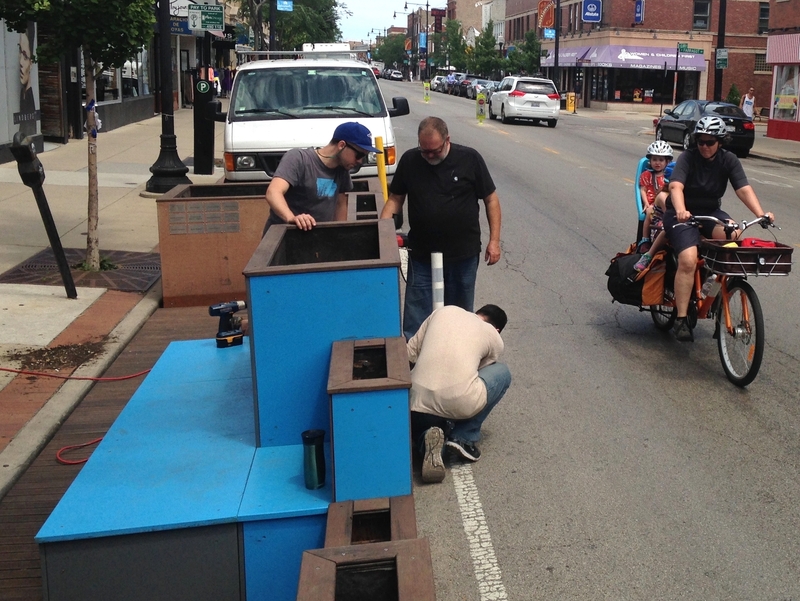 CDOT didn’t get back to me with an update, so last week I called Ellen Shepard, head of the Andersonville Development Corporation, which raised all the money for the two parklets and handled the nuts and bolts of getting them installed. She said the Farragut People Spot was actually being put back in that day by a crew led by former ADC sustainability programs manager Brian Bonanno, a few storefronts south of the original location. 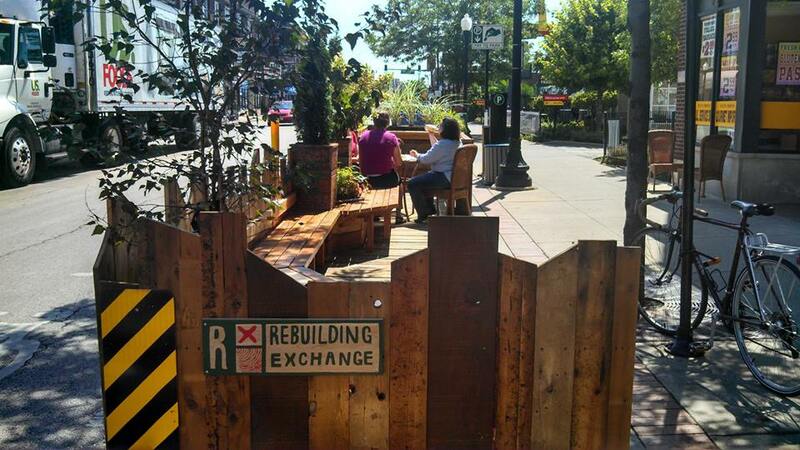 However, she said the Olive Street parklet still needs repairs due to wear-and-tear from repeated removal and reinstallation, and they’re also looking for a new location. “The business owners like the People Spots to move around,” she said, but claimed the fact that the seating replaced two car parking spots didn’t influence the decision not to return it to the same place. Actually, the merchants told me the parking space issue was a major factor. An owner of the Coffee Studio declined to comment, except to say, “For some business types, reduced parking or standing-zone access is a big deal.” However, an employee told me he’s only heard positive feedback about the parklet from customers who enjoyed lounging there with cappuccinos, and many people have asked whether it’s coming back. In the middle of last week, I stopped by the site where Brian Bonanno and contractors were finishing up the reinstallation of the Farragut People Spot. Although he officially left the ADC in June, he agreed to do the work as a final project. Bonanno feels CDOT’s current People Spot program isn’t sustainable. “It’s just too expensive the way it operates right now.” The Olive parklet cost about $15,000, and the Farragut one was roughly $30,000. Removal, storage, city permits, reinstallation, and new plants cost upwards of $5,000 each year. Next Post Dime Stories: Dime Stories is a Book and I’m Going to Lollapalooza!